Ideal for inside or outside your home. 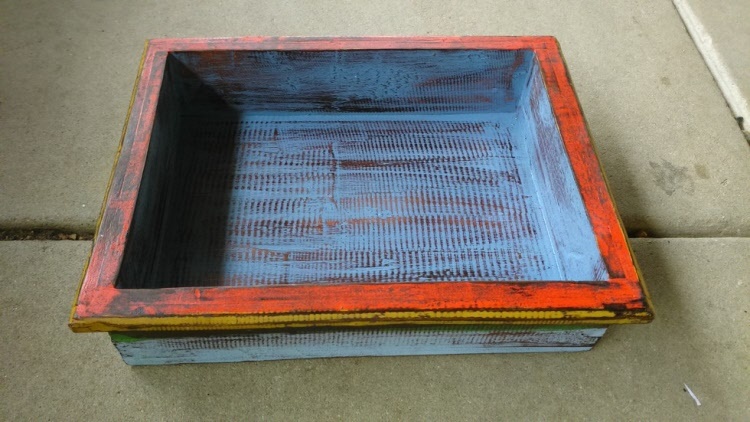 Some are serving trays, some are suitable as magazine caddy's or racks, some are key cupboards with hooks inside. Take a look around we are sure you will find at least one that suits your needs. Always find it hard to remember when you left your keys? Here's a great solution. The Key cupboard! Made from wood and painted in lovely pastel colours with a latch on the door. 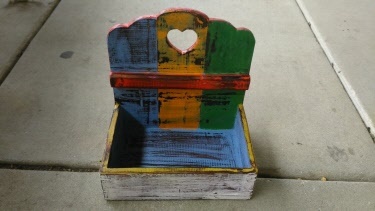 A great box made from light weight wood and hand painted in pastel tones. 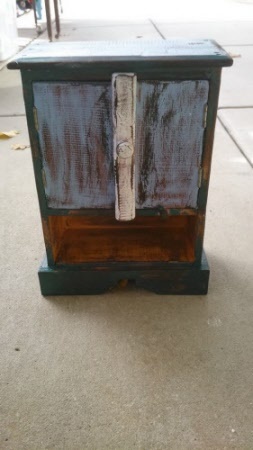 Has handles on the side. Click photo to see larger. Ideal for storage, keep your cd's, book keeping records, magazines or whatever you wish inside. 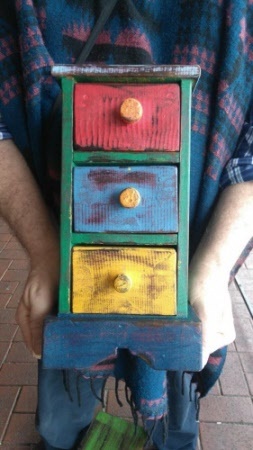 Looks great as a piece of decor in your home. Or have it on your verandah with plants in. So many great ideas for this fabulous item. 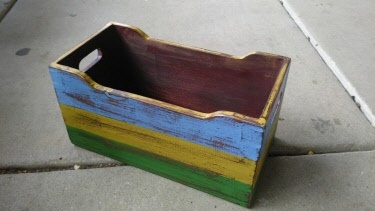 Fabulous decorative caddy with handle, painted in pastel tones with that distressed look. Made from lightweight wood with a sturdy construction. Choose what you would like it for, use it as a shoe polish storage box, a decorative planter for your porch, magazine rack for your living / reading room. 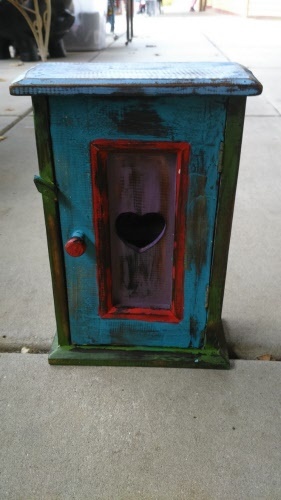 Or store just about anything you'd like inside. One lady bought one to display her daughters teddy bear collection in. 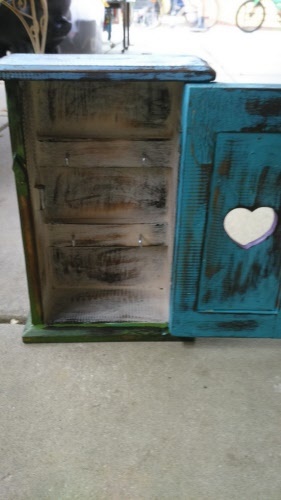 Little chest of drawers hand made from lightweight wood hand painted and given that distressed / aged look. Can be used to store your keys, your gemstones, your jewelery, your coin collection or anything you like. A loveley piece, this mini wardrobe comes with a latch, two doors and three shelves. Hand painted in muted tones and made from wood. Can be used to store your valuables or collectibales in. A great piece of home decor. 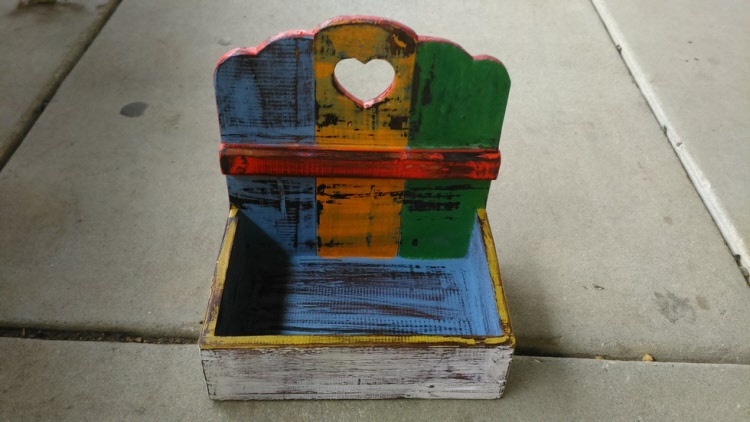 So many uses for this brightly coloured tray with a heart shape cut in the back panel. You can display your soaps, business cards, flowers, giveaways or anything you choose. Would be a great piece of decor for your home. Click on photo for a larger view. 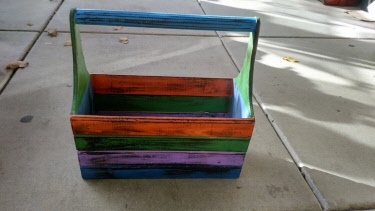 Made from lightweight wood and well made and hand painted. 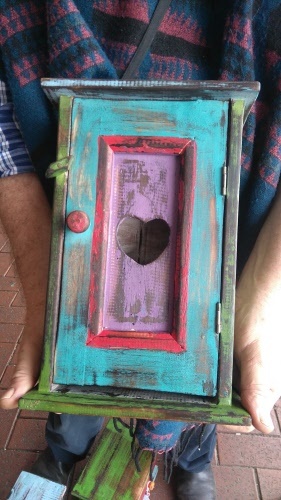 It has two metal rings at the back so you can hand it on your wall if you wish. Or just place on a side table or on your verandah.Great as a desk tidy in your office too. Or display your plants or flowers inside. 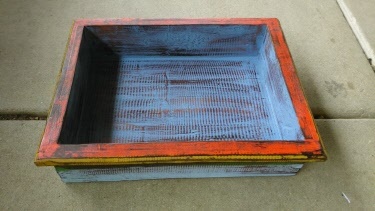 A beautiful tray, hand made from lightweight wood and hand painted in muted tones. A great home decor item so many uses. Display your fruit or vegetables in your kitchen, put all your pens and writing paper inside, a general desk tidy. Use for your paperwork or just keeping everything from rolling across your table. Serve tea and biscuits in it.